BAHAWALPUR, Pakistan -- Alerted by an announcement over a mosque's loudspeaker that an overturned tanker truck had sprung a leak, scores of villagers raced to the scene with fuel containers Sunday to gather the oil. Then the wreck exploded, engulfing people in flames as they screamed in terror. At least 153 men, women and children were killed, with dozens more in critical condition, hospital and rescue officials said. 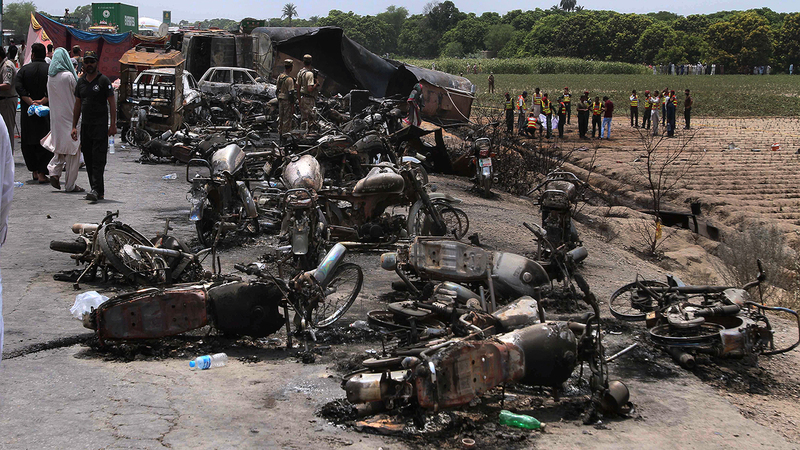 About 30 motorcycles that villagers had used to rush to the site of the highway accident lay charred nearby along with cars, witnesses said. Local news channels showed black smoke billowing skyward and army helicopters taking away the injured. As victims cried out for help, residents wandered through the area, looking for loved ones. Zulkha Bibi searched for her two sons. "Someone should tell me about my beloved sons. Where are they? Are they alive or are they no longer in this world? Please tell me," she pleaded. Many of the dead were burned beyond recognition, said Dr. Mohammad Baqar, a senior rescue official in the area. They will have to be identified through DNA. The disaster came on the eve of the Muslim holiday of Eid al-Fitr, which marks the end of the fasting month of Ramadan. While Saudi Arabia and most other Muslim countries celebrated the holiday Sunday, Pakistanis will mark it on Monday. The fuel truck was traveling from the southern port city of Karachi to Lahore, the Punjab provincial capital, when the driver lost control and crashed on a highway outside Bahawalpur. A loudspeaker atop a mosque alerted villagers to the leaking fuel, and many rushed to the scene with fuel containers, said Rana Mohammad Salim, deputy commissioner of Bahawalpur. Highway police moved quickly to redirect traffic but couldn't stop the scores of villagers, spokesman Imran Shah told a local TV channel. When the fire erupted, the same mosque loudspeaker called on the remaining villagers to help put it out. Mohammed Salim said he ran toward the smoke with buckets of water and sand, but the heat was too intense for him to reach the victims. "I could hear people screaming, but I couldn't get to them," he said. Dr. Javed Iqbal at Bahawalpur's Victoria Hospital said most of the patients suffered burns to upward of 80 percent of their bodies. Many were evacuated by plane or helicopter to hospitals in the Punjab cities of Lahore and Multan.